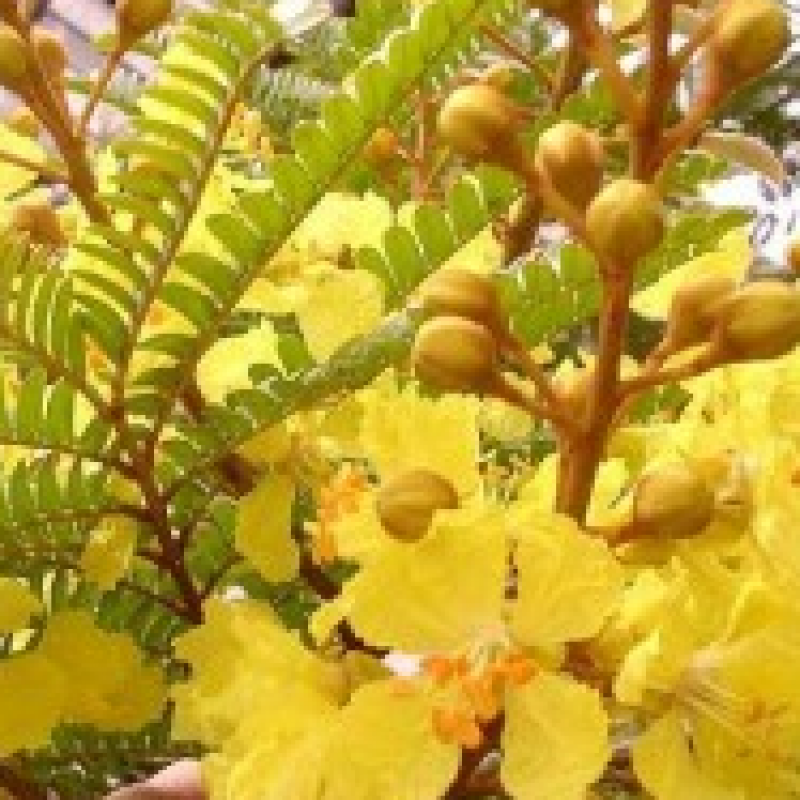 Yellow Poinciana is a very showy flowering tree up to 50' tall, with wide-spreading branches that form an umbrella-like crown up to 25' across. The stems and twigs are rusty-red tomentose. The leaves are bipinnate (twice compound), about 2' long with 8-20 pairs of 3/4"-long oblong leaflets. The fragrant flowers are clustered on upright stems about 18" long. Each flower is about an inch and a half across with translucent yellow, crinkled petals. The flowers have conspicuous orange stamens and each petal has a reddish brown mark in the center. They are followed by purplish brown, flattened, oblong seed pods, 3-4" long, which remain on the tree until the next flowering season. Add top soil or organic peat moss to the hole when you plant. You may want to add in composted cow manure to the mix. This tree is considered drought-tolerant once established, but does best with a regular watering schedule that allows a bit of time for the soil to dry out between waterings. Trimming isn't necessary other than to prune branch ends after flowering is done in order to promote more bushy growth. Also you can remove any too-low branches as the plant matures. The seed pods will fall off on their own, and aren't a nuisance. Fertilize 3 times a year - once each in spring, summer and fall - with a quality granular fertilizer. This is a VERY showy umbrella shaped tree. 18" CLUSTERS of very fragrant flowers followed by copper colored seed pods which while hanging are very showy themselves. Fast growing & vigorous, up to 50' tall and 25' wide. Needs moist, but well drained soil until established. Zones 9b-11, 27-28F MAX or very short periods of frost. Most of our plants that are said to be able to handle short periods of frost, Must still be protected during winter until they get well established, to be on the safe side! This tree does well in semi-shade, but can tolerate full sun if well watered during growing season.